NRI servicing is an art in itself and we at subhAAkritee are the experts of the art. When it comes to NRI projects, we understand the additional emotions involved in developing the property. Whether personal or commercial, it is a way for the NRI to connect back to his/her roots, and we support them right through. Ensuring best quality services at affordable rate, we at subhAAkritee have a team of professionals who take special care in understanding the needs and expectations of the clients. We often understand that the client cannot be physically present with us and we have the necessary infrastructure to coordinate with them and ensure their inputs are met. We provide visual walk through of the property under construction through images and detailing. We also understand the involvement of the family members in these projects and take the effort of considering their inputs before going ahead with the final layouts and creative outputs. And the end of it all, the equation boils down to trust. And our experience in working with multiple NRI clients over the years has earned us the reputation of being trustworthy and cooperative right through a project. Our Services:- From Retail to healthcare, from cut throat commercial to artistically inclined personal spaces, we at subhAAkritee provide interior design services across all sectors. "subhAAkritee” Interior Designs includes as per excellence execution to remodel or decorate space may be Commercial/Residential for NRIs. We provide effective communication with our lead designers and architects during the entire process of designing your comfort zone for NRIs with special care. So now onward you don’t worry about miles away to enjoy the comforts of Interior Design !! SubhAAkritee has a specialty wherein they cater to the requirements of those clients who reside abroad but would like to get homes designed in India. 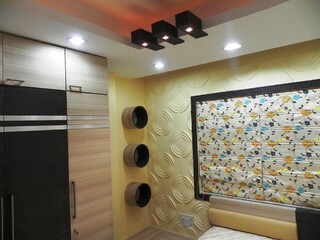 We at SubhAAkritee offer interior design solutions using latest technology to suit our client’s needs. All drawings of the designs are sent to you by email and we send regular images of the work in progress to give client additional assurance. Despite of constraints the fact that you are not present at the location but still you feel as if you is very much there, experiencing your dreams being shaped into reality. We have successfully provided such services to many non-residents from across the globe. In order to take appropriate measurements, subhAAkritee representatives visit your home or office to be designed. Our team will discuss with you on a conference call at length to know and understand your requirements, your taste, and lifestyle, design function, and will accordingly create layouts for the same. SubhAAkritee, The Design People is a full solution interior design firm that takes care of all your design and architectural planning needs under one roof. The company has been known to provide custom and best in class services for NRI and outstation clients where the client barely has to visit the site during the development phase. With branches in Delhi, Gurgaon, Bihar, Jharkhand and Kolkata, the team is highly efficient in living up to the demands and expectations of all kinds of clients. In addition to the best in class services, we are known to provide the most reasonable costs in the market, making us the best overall. Our process if very simple, we connect with the client through VOIP solutions, namely HoA and Skype. We take the initial briefing and then take the conversation forward by sending across the initial floor plan after the first site visit. Once the floor plan is approved, we make the 3D designing and all of it is sent across via mail. Extensive discussions are done on the VOIP solutions to come to the final conclusion and then developments start. Regular updates of the site progress are sent via mail and mid-level discussions are done.